MIAMI, Florida -- Issue #23 of X-ray Mag has been published and is ready for free download. 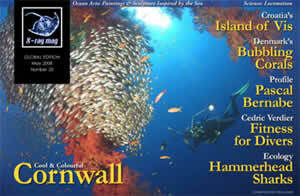 The latest issue features Mark Webster's tour through the underwater world off Cornwall, England, Pascal Bernab�'s insights into deep diving, Michael Symes's investigation into locomotion of sea creatures and the unique shape of Hammerhead sharks, Harald Apelt's feature on diving and travel to Croatia, Kurt Amsler's discussion on digital photography workflow, Cedric Verdier's article on diving physical fitness and DIR for rebreather divers, Cindy Ross's discussion on sunscreen, sun rays and skin cancer, and much, much more. X-ray Mag is a Copenhagen, Denmark based international dive lifestyle magazine published 8 times per year and read by over 200,000 readers in 80 countries. Compiled by an international network of editors, underwater photographers and dive writers, X-RAY MAG is the planet's only global dive lifestyle magazine. Best of all, it's free.